Counting coins is in the second grade Common Core math standards, but it’s so important to begin to work with coin values and counting combinations early. The ability to switch values while skip counting can be tricky, especially if students aren’t being very attentive. Giving students continued practice, and working with coins in many different ways really helps build students’ coin counting skills. When I taught first grade, I introduced coin values at each numbered day of school (day 1, day 5, day 10, and day 25) and we worked on skip counting every single day during our calendar time. I introduced the coins and their values using the common, well known songs and used posters that are in my classroom decor sets. This daily repeated exposure proved to be so beneficial as my students learned the coin values through this routine without any outside practice. They also became pretty fluent with skip counting coin values. You can see more about my calendar routine in my blog post by clicking the image below. In first grade I also worked on ship counting coin values through repeated practice with my 5 in a Row game. I chose which levels we were going to work on, and then students practiced skip counting. They didn’t know they were skip counting coin values because to them, they were just counting to fill out their boards. One of the things I love most about my 5 in a Row game is that I can customize the speed of the game. When we first played in first grade I added additional time to the preset game. I gradually sped it up a second at a time. Because I was in the unique position of looping with my students from first and second, I knew what they were ready for in second grade and we continued to play the same game but at increasing speeds. We also added in the values with quarters in second grade. Click the image below to head to TpT to check it out. In second grade, I also added the coins themselves to our 5 in a Row practice. It was important for me to build students’ skills with recognizing coins, before we added the speed component. The kids continued to love playing, and it increased the level they were playing with by adding the coin faces. It was the clear next step for their skills. This Counting Coins 5 in a Row can also be found in my TpT shop just by clicking the image below. I also created these Coin counting worksheets several years ago. I created them with Valentine’s Day in mind, but they are versatile enough that they can be used for really any time of the year. There are 3 different levels of worksheets with 10 pages at each level, making them perfect for leveled differentiation in the classroom. Or, they can be used throughout the year as you continue to build on rigor. The first version has students finding the value of a collection of coins by identifying the coins needed to purchase items. The second version has students doing the same skill as the first one, but they’re written in story problem format. The simple and straightforward word problems give students much needed problem solving practice, and also working on the same skill at a slightly more difficult level. The third version takes money a step further by working with story problems where students have to identify the change given in return. The focus of these word problems remains on coins and values under $1.00 but there are still several scenarios with students working with amounts within $3.00. This builds the needed skills to continue to work with larger amounts of money and continued real-life experiences. There are 30 pages in all (10 pages at each of the 3 levels). The coin values stay consistent at each level so you’re able to give the 3 levels of worksheets out to truly differentiate (i.e. page 1 works with the same values of items on all 3 levels). 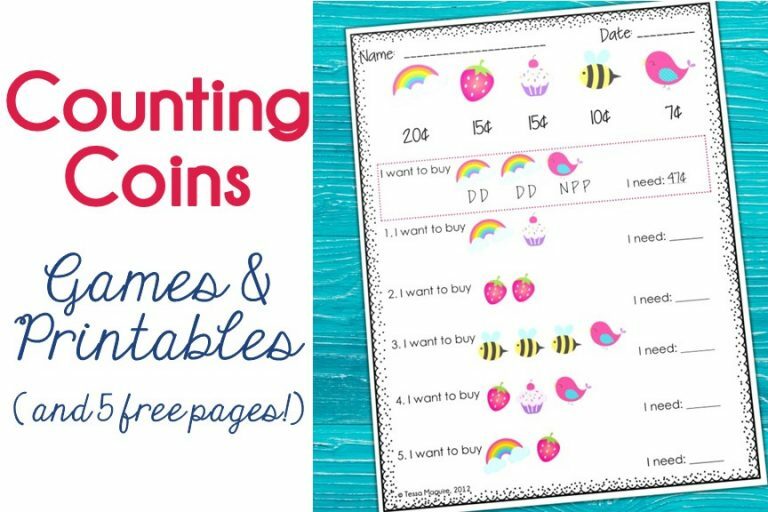 You can purchase this Counting Coins worksheet set from my TpT store by clicking any of the images above or the cover below. You can download 5 level one pages for free by clicking the image below. Do you have any tried and true ideas or resources for working on coin values and adding a collection of coins? Thanks for the freebie! I'm your newest follower. Come check out my blog Johnson's Jungle if you get a chance! Thank you! I'm now following you! cute – I just printed a copy! Oh. My. Goodness. Why did I have such a hard time uploading the correct file?? It is now correct. I'm so sorry about that and thanks for letting me know. Also, it's 4 not 5, I had combined the one and 4 instead of remembering the one was within the 4- if that rambling makes sense.